Nitrate is reduced by micro-organism in two ways. Assimilatory nitrate reduction mainly occurs during the anaerobic condition in absence of nitrogen. In this reduction process, nitrate and ammonia are used for the synthesis of organic nitro-compounds and amino-acids.In assimilatory nitrate reduction, the nitrate does not play any role in energy production. Dissimilatory nitrate reduction is carried out under the anaerobic condition where bacteria use nitrate as an electron acceptor. Further, this nitrite is converted to ammonia by nitrite reductase and the ammonia formed is assimilated. The nitrate reductase test is performed by using two indicators and the reduction of nitrate to nitrite is detected by using two indicators and that is sulphanilic acid and α- naphthylamine. The aim of the experiment is to carry out the nitrate reduction test. In nature, many micro-organisms posses nitrate reductase enzyme when these micro-organisms are exposed to nitrate as a sole source of energy have the ability to reduce nitrate to nitrite. Here in nitrate reductase test we expose this micro-organism to a media containing nitrate as a sole source of nitrogen and energy and further this nitrite is detected by using two reagents Sulphanilic acid and α- naphthylamine. Take sterile peptone nitrate broth and inoculated it with loopful of test culture and this inoculated broth is incubated for about 24 hours at about 37 ° C.
After incubation 0.5 ml of reagent A that is Sulphanilic acid is added and then reagent B α- naphthylamine is added observe the test tube for development of red colour. Further, if no red colour develops a pinch of zinc dust is added and mix properly and the test tube is observed for development of red colour. If the development of red colour is observed after addition of reagents then it indicates positive nitrate reduction test. 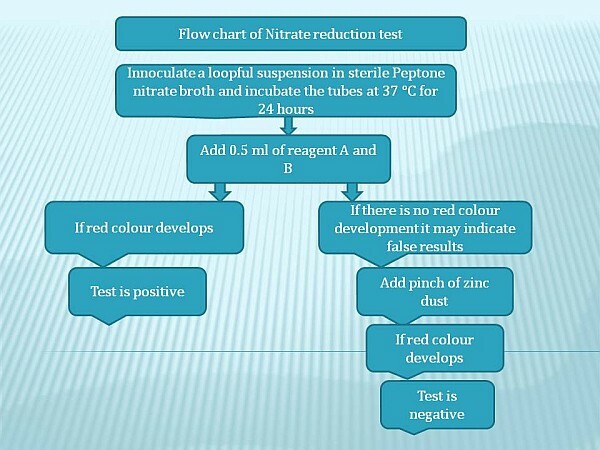 If after the addition of both reagents there is no red colour formation then it may indicate negative nitrate reduction test or false result because there is a possibility that the microflora present in the tube may reduce the nitrate to other byproducts like ammonia,molecular nitrogen,nitrous oxide,nitric oxide and as the test reagents detects only nitrates so it can give a false negative result so to clear this doubt a pinch of zinc dust is added and tube is observed for red colour development . Here zinc ions reduce nitrates to nitrites and we can observe the development of red colour as zinc ions confirm the presence of residual nitrates and this development of red colour indicates negative nitrate reduction test.